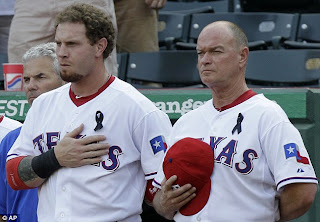 By now I'm sure you've heard about Shannon Stone, the 39-year old Arlington area firefighter who suffered a head injury which subsequently took his life while he was trying to catch a foul ball for his son during a recent Texas Rangers game. What happened on July 7th at the Ballpark in Arlington transcends sports and considering what was lost on this night, it truly makes the game of baseball seem inconsequential. In what is one of the most tragic and heart wrenching tales of sorrow imaginable, a six-year old child witnessed his father die right before his eyes as he tried to create an incredible memory for his son (getting him a foul ball at a Major League Baseball game). Awful occurrences like this don't happen in movies, let alone at live sporting events, and it seems unlikely that even the worst of enemies would wish such a fate upon one another. And yet, somewhere in Texas, a young boy, his mother, and their extended family are coping with unimaginable sorrow, grief, and hundreds of other emotions most people couldn't even comprehend. Jenny Stone, the mother of Cooper Stone, has already stated that she's worried for her son's well being after he experienced such a horrific life changing event, and understandably so. Regardless of the circumstances, it's never easy for a young child to lose his father, and the fact that this happened during a regionally televised professional baseball game only adds to the difficulty of dealing with an already unconscionable situation. The Stone family is now trying their best to cope with this tragic event that has turned their lives upside down and there's little doubt that they want their privacy to be respected. Unfortunately, Shannon Stone's death has become a national news story, which has already been given a lot of coverage and figures to get plenty more before all is said and done. Considering that we live in a society which often looks for somewhere to place blame after anything goes wrong, what happened to Shannon Stone is truly a difficult situation to deal with. Perhaps you could blame the Rangers for not having better safety measures in place to prevent a fan from falling (which they should have), but in all actuality, Shannon Stone's death was a freak accident. A fact that makes what happened even harder to swallow. As fate would have it, the player who was on the other end of the ball which Stone was reaching for right before he fell was none other than the Rangers Josh Hamilton, who has dealt with (and continues to deal with) a myriad of personal demons throughout his life. Hamilton usually doesn't heed fan requests for foul balls but did so on Thursday night, and as his good deed suddenly morphed into a nightmare, it's impossible not to feel for him as he tries to deal with his role in this tragedy. 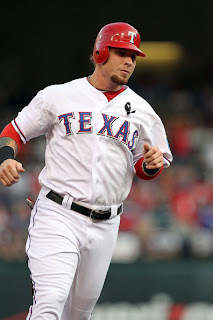 What happened obviously isn't Josh Hamilton's fault but for the rest of his life, he will have to live with the fact that had he thrown the ball a little further or not thrown it at all, Shannon Stone would still be alive. A sobering and potentially soul crushing realization to be sure. In an unspeakably cruel twist of fate, a son lost his father, a wife lost her husband and there isn't anything that can be done about it. In spite of all this, I'm a firm believer in the fact that almost every tragedy has the ability to bring out the best in human beings, and this situation is no different. Josh Hamilton and the entire Texas Rangers organization have the opportunity to be there for the Stone family, and in turn, the Stone family has the opportunity to be there for Josh Hamilton and the entire Texas Rangers organization, during what is no doubt a time of incredible heartache and suffering for everyone involved. Hamilton specifically, has the chance to be there for Cooper Stone, who presumably no longer has a father figure in his life. Far be it from me to tell anyone how to handle this situation, but it seems like Hamilton's guidance and presence would be invaluable in Cooper's life as a potential mentor, role model, and friend (assuming he continues to stay clean and win his battle against addiction). As beneficial as Hamilton's presence might be for Cooper and his family, it seems almost certain that being able to connect with the Stone family would be even more beneficial to Hamilton, as he tries to cope with, and recover from what has happened. Shannon Stone's death has forever changed a family, an organization, and Josh Hamilton's life, and while the first chapter of this terrible story has already been written, it certainly doesn't mean that what happens in the coming weeks, months, and years needs to follow suit.